Is patience overrated, or is it the key to having a successful race? As I write this, it is June 17th, 10 days until I get to toe the line at the “big dance,” the Western States 100 for those who aren’t familiar. It’s 8 a.m. and I’m sitting at my kitchen table sipping a lukewarm cup of Keurig coffee (I hate that damn machine but my boyfriend loves it), and a bowl of coconut-flavored Noosa yogurt mixed with raisin-almond granola. Patience, I was never good at it. (Just ask my parents.) My attention span is super short, so anything lasting longer than 10 minutes is a rough go for me. And when I want something, that means I want it now, not two days from now. A hungry Gina stuck in traffic is no fun for anyone. 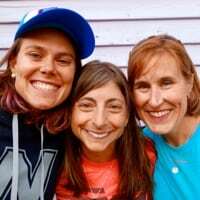 Since the Western States 100 and Hardrock Hundred are looming, I figured I’d reach out to women participating and get their opinions on patience. I figure they have to have something to say considering they are all about to spend a day or two on their feet running. The most obvious parallels are training and racing. To be an ace at anything, you need to put in hours of work, build a foundation, and gain experience. Change and vast improvement don’t just happen over night. Any ultra you run means hours of time on feet. Therefore, a runner has to harness their inner ‘Pre’ and prepare for a much longer and slower day on the trails. I’m pretty sure all seasoned ultrarunners have gone out too hard in a race and have experienced a blow up or have had their wheels come off. I certainly have. It is quite obvious that patience must be exhibited on the physical side, but what about mentally? You need to teach your mind to relax and keep control of the machine it is driving. This may be the hardest part for most runners. Ironically, we racers aren’t the only ones that need to embrace patience. I’ve put my boyfriend through some ‘interesting’ situations that most people would never care for or support. Justin is about to use some of his vacation days just to come out and crew for me at Western. Granted, I know he thrives off of the running scene, but I doubt he is excited for the low points in the race where I’ll be a crotchety bundle of fun. Ha! It takes a special person to put up with all the prep that goes into a race… and especially who is happy to clean all the salt and crusted gel from your face. I’ve been pushing the importance of patience this entire article, but maybe there are times when patience should be disregarded. Maybe patience is occasionally overrated? With such stout and experienced competitors entered in both Western States and Hardrock, it will be interesting to watch how they tackle the course and what strategies they will use to get them to the finish line. To what degree will patience lead them to the finish? What strategy do you think will win the Hardrock Hundred and Western States 100 this year?